You pitched it by noting some ongoing discussions we’ve been having, so let me just note for the record that I don’t disagree with anything you said here and I certainly hope I’ve never implied otherwise. I do a lot of posts standing up for the value of mathematics in biology, and defending it against people who think it’s of little value, or who misunderstand why it’s valuable. But I certainly don’t think that all good biology is mathematical, or that the only way to discover anything is to first build a mathematical model to generate some testable hypothesis. Believe it or not, my labmates and I actually have done work along these lines. Work that’s out ahead of existing theory, or disconnected from existing theory, that identifies new patterns that future theoreticians might want to explain. In grad school, my labmate Jill McGrady-Steed did one of the first biodiversity-ecosystem function experiments (McGrady-Steed et al. 1997 Nature). At the time, “theory” on this was hardly worthy of the name–people had a few arm-wavy verbal ideas, but that was it. I recall at the time that we all thought this was a strength of Jill’s experiment–it would be interesting no matter how it came out, because nobody really had any idea how such an experiment should be expected to come out. Jill also found some patterns in her data to do with the relationship between biodiversity and the variability in ecosystem function, which wasn’t something anyone at the time had even thought to look at. And in 2002 I used her data to ask some different questions, in the course of which I discovered that food webs tend to collapse to a roughly constant value of connectance, independent of their species richness. Which is really intriguing, because in comparative data from nature, food web connectance is indeed roughly constant, and more or less independent of species richness. Again, this is a pattern on which there’s basically no explanatory theory (though there really should be–c’mon theorists, get on it!). I often refer to these examples to push back against people who think that the microcosm systems in which I work are too simple to ever surprise us or teach us anything new. Well, what’s science without math? There’ll be more of this ongoing conversation, of course. When editing, I realized I had to cut back on, “this idea came from this link, and that one from that one…” and I’m now in frantic getting-ready-for-field-season-even-though-there-is-so-much-left-to-do mode, so I’m into shifting gears. Oh, I haven’t seen anywhere that I don’t agree with you. Our stuff comes from different perspectives but I think there’s mutual appreciation to go around. You’re making my case that stepping back to find the fundamental nature of relationship is something we need to do more! Not that I’m getting arguments against it, but few want to do what gets called “descriptive work.” The key is to choose something interesting and novel to describe rather than just filling in little holes. Theory is built on trying to explain patterns. Sometimes the theory in explaining known patterns also provides predictions for interesting or important patterns not yet measured (or even thought of). Other times many theories are developed for a limited set of patterns, and people spend a decade unsuccessfully trying to use these limited patterns to differentiate among the theories of the underlying mechanism, when what was really needed were more patterns. I guess the goal of theory should be to help you make educated guesses about the important things to measure but oftentimes it can be a distraction in that people will spend a long time using limited data to try to confirm or reject theories. I find this super interesting! Thank you for pointing me to the paper! Sorry you didn’t have anyone to share it with, I would’ve flipped out = ). Can I ask a few questions? So clearly you collected a ton of colonies of all of these species to get the per-species regression. Was there any association within-species between colony size and worker size? I don’t know much about Pheidole – are there minims? 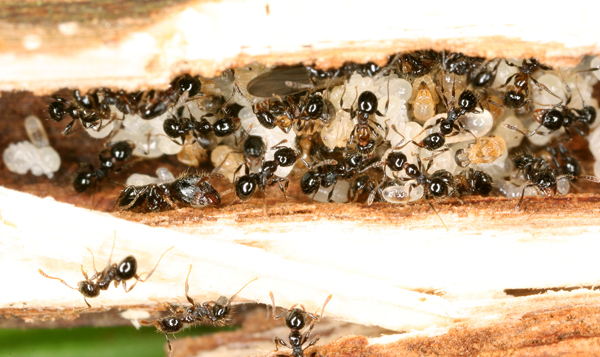 In Solenopsis invicta (which is continuously polymorphic), workers tend to get larger on average and the total variation in worker size increases as a colony gets older (and worker number increases). What happens if you regress minor size versus major size among all the species? You said that they’re strongly autocorrelated, but what’s the slope of that line? And this last question is unrelated, but maybe you’ve seen it in the literature somewhere: what’s the size distribution of Pheidole larvae? Is it typically normal/unimodal, or is it bimodal, with a population of larvae destined to become majors and a population destined to become minors? I feel like the threshold shifting model sort-of implies a unimodal distribution, where the threshold is just getting moved further and further left on the curve. And P. harrisonfordi – was it the most charismatic of your microfauna? Buck, you should sign up for the SWRS ant course this summer! Pheidole are dimorphic (a few are trimorphic). Discrete soldiers and workers, with little intraspecific variation in size in each caste. I didn’t measure body size with respect to colony size, but others have and have found little association. The slope of that line is, I think, around 1. There is appreciable variance, though. Both are predictive of soldier ratio, but the relationship is tighter for minors. It would be interesting to find out what sorts out how some species have much bigger soldiers than others. That’s been out of my scope, so far. Larval size at the last instar varies, of course. The physio work by Wheeler and others have shown that the body size of larvae (and hormonal titers) at a threshold moment determines whether the larva will follow the route to a minor or a major. What I found is that this threshold shifts down with body size, more or less. Andy Yang has a great paper on this in Current Biology, with lots of figures of distributions. The harrisonfordi thing actually bugged me. I had to redraw the figure in review, because before Wilson, it was ruida. I hate changing figures once I get them pretty. That’s funny about harrisonfordi. Yeah, actually I did the calacademy ant course in Uganda this past summer; I’m a 4th year undergrad, starting a PhD this fall. I’m headed to Rockefeller University, very possibly to work with Daniel Kronauer. The question about the distribution of brood sizes was because it might provide further evidence (or not) for the threshold shifting idea. I’m not sure if this is right, but my thinking is that if the the brood are more or less unimodally distributed in size (within a given colony), then it’s easy to see how you could shift the threshold between workers & soldiers up, and end up with larger minors and soldiers and fewer soldiers overall, so it fits the hypothesis. But if it’s a bimodal distribution, that might imply that the ants are underfeeding a subset of the larve so that they become minors, and overfeeding a different population so that they become soldiers. I feel like that must be the case at least some of the time, because some species have such massive soldiers, it’s hard to imagine they’re just the outliers of an otherwise minor-destined population. Does that make sense? If a bimodal distribution is the case (some or all of the time), it seems like moving the threshold might not necessarily change the average worker size or the proportion of soldiers very much; if the ants are capable of “choosing” whether a larvae is fed to become a soldier or minor (which I think would be implied by a bimodal distribution), why doesn’t selection just drive them to the ideal ratio in each species, destroying the pattern you’ve seen? I agree with your interpretation – I think there must be some sort of constraint that preserves the trend. Larval body sizes start out distributed unimodally; then those above the threshold size, soldiers differentiate. The relative position of the threshold drops with body size, intraspecifically according to Yang, and throughout the genus according to this paper. It’ll be interesting to see if any outliers are found. Where I talk about how we are really ALL modelers! Our models just look different. Where the data collecting scientist (think Tycho Brahe) spends his/her time dreaming about where to look and what to look for, the pattern former (your role here – think Johannes Kepler) seeks the big picture patterns and the ‘modeler’ in your terminology (Isaac Newton in the analogy I’ve been using) puts together the more rigorous connections. There is no rigorous theory without patterns to connect, and there are no patterns without data. We are all on the same team. And, it’s a lot of fun whichever role you play. For full disclosure, I’m a phd student in mathematical biology. Jake, well, when you’re a hammer, everything looks like a nail. Yeah, we’re all on the team. I myself, in this one study, didn’t do the modeling. But if you read the paper itself, it’s interpreted in light of the preexisting model. It’d be interesting if you made comments on the PLoS ONE site for the paper, which has been seen more than this post to be sure.